TEMPLE HISTORY :In the late 70’s a small group of like minded people pondered about having a temple in atlanta. Drs.S.P. Reddy, B.K. 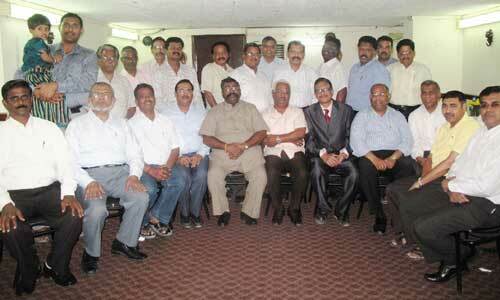 Mohan, Shailendra and Hari Upadhyaya met on a few occassions and felt that there should a temple in Atlanta. After initial deliberations and after visiting Nashville temple which was then located in a small house, a decision was made to proceed with the project. We thoght we each can contribute $10,000 and we can acomplish this goal, happily pray and provide a place of worship for our community and our children. We searched for land and looked at five different pieces of land. Decided on current property because of its elevation and proximity to highways and biways. Fifteen of us bought the land from Mrs Jewel P. Quinn for the temple. About four hundred people from Atlanta, and neighbouring states including Alabama, Tennesse, Florida and Carolinas, braved the hot and humid weather on this Sunday to witness the ground breaking ceremony of Hindu Temple Of Atlanta. It was the first major event of this temple. Temple architecture developed in two streams, Saiva style and Vaishnava style. Silpa is the architecture and Agama is the mode of worship. The Vaishnava worship is again in two different styles, the Vaikasana and the Pancharatra. In the Hindu Temple of Atlanta, the mode of worship is in the Vaikasana style. The structure of the main gate -Vimanam may consist of two to sixteen stories. The surrounding wall prakara may consist of seven layers of walls the seven prakaras of large temples. The main front gate with all its vimanas (stories) is a tapering structure like a spire. It is also called Gopuram, which literally means the city gate. 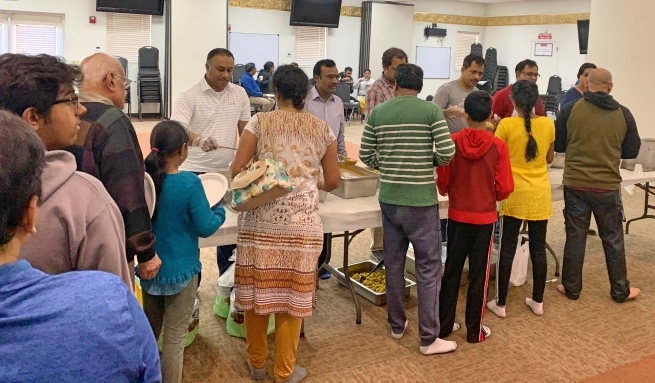 The temple in Atlanta is planned on the model of the Sri Venkateswara temple in Tirupathi in its features such as the sanctum sanctorum, the main hall, the spire and the boundaries. To the right of Lord Venkateswara is situated Sridevi an on the left is situated Sri Satyanarayana Swamy. Sri Durga is situated in a niche on the boundary wall. 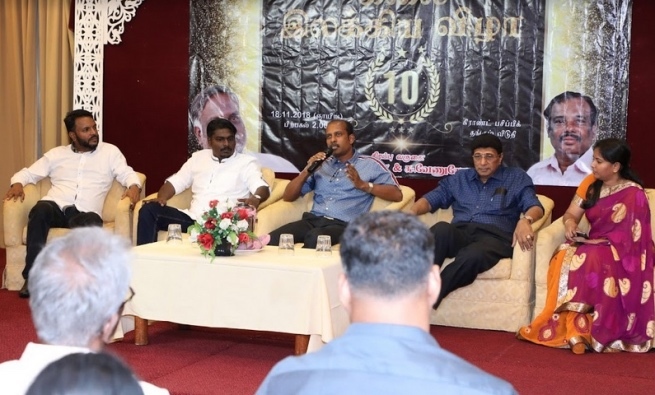 There are plans to provide a fag staff, Garuda, and a Balipitham (altar for sacrificial worship). There are separate shrines for Ganapathi, Anjaneya, and Navagrahas. 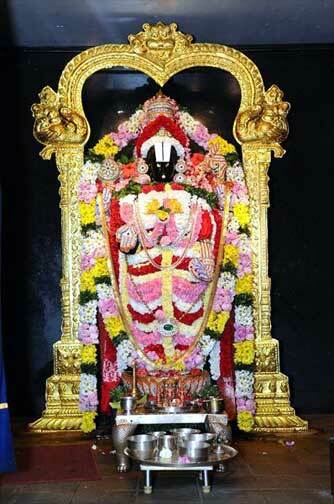 The main Vimana of Lord Venkateswara is called 'Ananda Vimanam' and has three stories. Sridevi and Andal and Sri Durga will be provided with vimanas of two stories each. The main entrance will have a Raja Gopuram consisting of five stories . 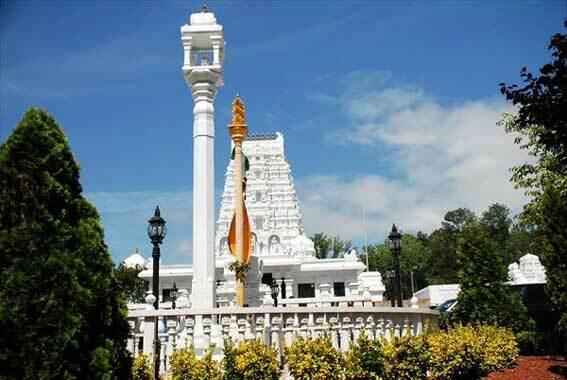 It was on June 22, 1986, that members of our community gathered in a vacant piece of land by the side of Georgia State Route 85 in Riverdale to perform the Ground Breaking Ceremony for the Hindu Temple of Atlanta. Almost three years later, to be precise, in March 1989, after assurances and pledges were received to fund the project, the actual construction of the structure began. The first phase of construction, carried out by the Holstein company and the Choate construction company, took about twenty one months. The first statue installed in these premises was that of Sri Maha Gannapathi. 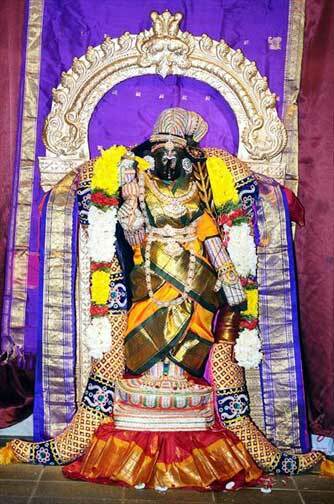 Murthis of Sri Venkateswara (Balaji), Sridevi(Lakshmi), Bhudevi, Durga, Navagrahas and Anjaneya were installed by May 1993. The added facilities of stage and sound equipment facilitated the use of the auditorium in the lower level by various groups of our community for cultural and educational activities. The bland masonry structure was yet to become a full-fledged Indian temple . He prepared for us a master plan incorporating the styles reminiscent of those that flourished in the times of Pallava and Chola dynasties of India a thousand years ago. The design is very similar to that of Sri Venkateswara temple in Tirumalai. However, this second phase of construction could not even start until the Silpis (the sculptors) arrived from India. In November 1993, when we received the word that visas were finally approved for the Silpis, we were all excited. One month later they were on the soil of the United Sates. Our temple complex incorporates several of the traditional elements of an authentic ‘South Indian’ temple: 1. Four Vimanas (or shrines), one each for Venkateswara, Sridevi, Bhudevi and Durga. Each one has a garbhagriha (sanctum). The Venkateswara sanctum has a mukha mandapa (entrance hall) structurally connected to the main assembly hall. The other three sanctums have artha mandapas to connect them to the main hall.2. Mahamandapa, the main assembly hall in which the devotees gather.3. An entrance mandapa (the front lobby).4. Rajagopuram (gate-way tower) over the entrance mandapa raising above over all other strucures.5. A separate shrine for Ganesha inside the main hall.6. An altar for Navagrahas.7. A separate shrine for Anjaneya in front of the main structure.8. Dhwajasthambham ( a flag pole)9. Balipitham, a dispensing seat in the form of a flat lotus in bloom.10. 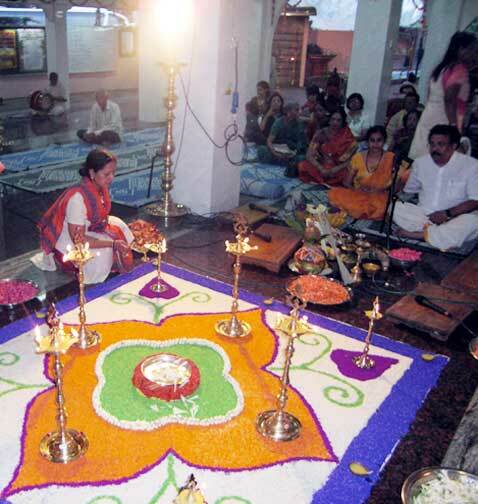 Yagasala for performing ‘havan’ and other oblutions.11. Front entrance mandapa.The walls inside and outside, the vimanas, the gopuram and the entrances would all be decorated with ornate sculptures based on Maricha Samhita and Vaikhanasa Agama. Of these eleven elements, 8,9 and 11 are still to be completed. 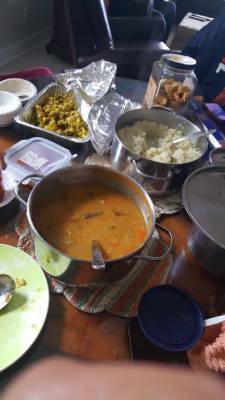 In the lower level we have a kitchen (paka sala), dining hall (kuta), and an auditorium for assembly (kalyana mandapam). The Rajagopuram rises approximately 40 feet high above the ceiling level , rising tier upon tier (up to five tiers) and tapering into a wagon-roof sikhara with a mahanasi (fanlike motif) on either side. 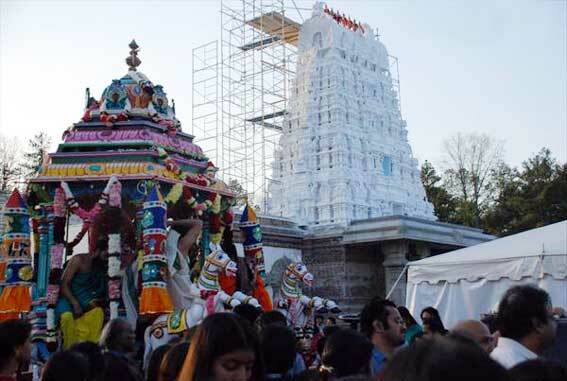 The gopuram is 22x14 feet at the base. Each story has four corners called karnakutas. There are seventy six pillars on each story. There are four faces to the gopuram. On the east face and west face the area with dwarapalakas is called ‘mukha sala’. The structure on either side of this is called ‘koshtam’. The horizontal area with designs adoring the koshtam is called ‘kapotham’. The south face of the Raja Gopuram is decorated by a ‘mahanasi’ on top, followed by Lord Narasimha on the top level, followed by Sri Mahavishnu in various poses in the next three levels. The lower most level is decorated by Sri Narasimha again. On the north face, Mahavishnu is on the top and lower levels and Narasimha in the three middle levels. The sculpturing of the ornamental work is a very tedious process. It took nearly seven months to complete the work on Rajagopuram. One has to watch the work in progress to comprehend the complexity of the process. Balaji This shrine is designed in Chola architecture with extensively detail work on the outside . The top of this shrine is known as Vishnukantha Vimana. It is octagonal in shape with Garuda statues at the four corners. The Vimana is divided into three parts - vedika, kantham and sikharam. Facing east we have a statue of Balaji, facing south is Dakshinamurthy, facing west is Narasimha, and facing north is Adi Varaha. This vimana is 36 feet tall and 17 feet wide. Lakshmi,Bhudevi, and Durga Temples These three shrines are of similar dimensions, 27 feet tall and 12.8 feet wide. Statues on the vimana for Lakshmi are of Mahalakshmi in different poses and for Bhudevi shrine are those of Bhudevi. For the Durga shrine the architecture is slightly different. It is in the Pallava style and is a four-sided Brahma kantha vimana. Durga in different forms is depicted on this vimana. These three shrines have about 112 pillars in addition to other decorative sculptures. 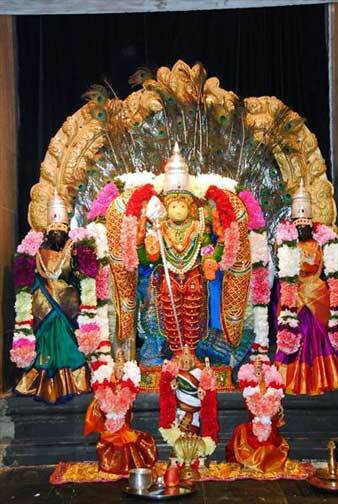 Sri Anjaneya shrine: This shrine, 20.6 ft high and 10.8 ft wide, is located at the front entrance of the temple complex. The vimana has four different statues of Anjaneya. 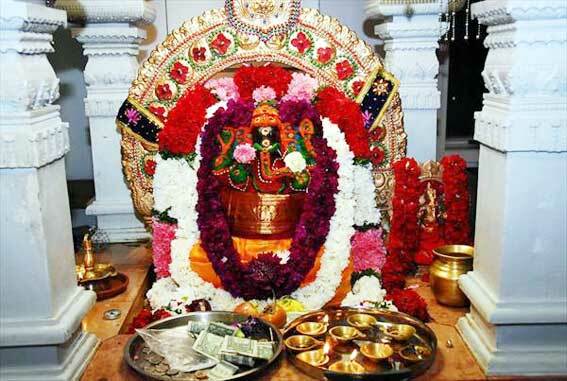 Sri Ganesha shrine: The Ganesha shrine is 11.3 ft high and 5.2 feet wide, smallest in size and located inside the temple, in the mahamandapam, next to the Durga shrine. The vimana is decorated with ornate designs and statues of Ganesha. The Navagrahas These nine planet gods are installed on a open vedika inside the mahamandapam. In niches flanked by carved pillars (sthambhas) adorning the side walls are sixteen statues. Facing Lord Venkateswara, we have on the right wall the statues in the following order starting from the sanctum end: Adi Varaha, Narasimha, Satyanarayana, Venkateswara, Rama. Krishna, Dakshinamurthi and Chandrasekhara. On the left wall we have Saraswathi, Lakshmi, Meenakshi, Kamakshi, Rajarajeswari, Kamakoti Sakti, Durga, Subrahmanya Swami and Ganesha. 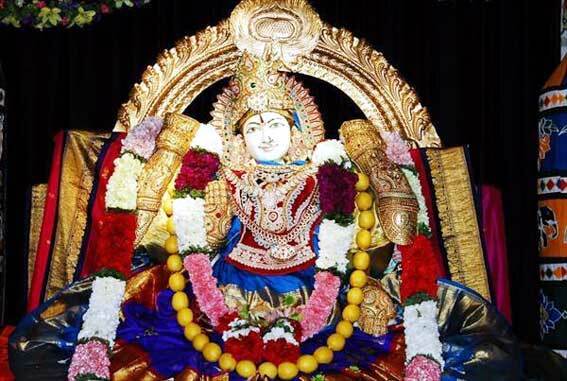 Kumbhabhishekam is a purification ceremony usually performed every twelve years. This purification ceremony also nullifies any unintended transgressions, deficiencies in the daily pujas recitation etc. During this elaborate religious event several homas are conducted according to agamas. This whole process synergises and unites the devine powers with the vigrahas of the lord. Kumbha means head and denotes the sikharas of the temple. On Saturday (May25th,1996) sanctified holy waters were poured over sikharas of all the temples with vedic chanting. At the conclusion of kumbhabhishekam flowers were showered from a plane.On 26th May one thousand and eight kalasas filled with sanctified water ware used to perform Abhishekam for Balaji. All the priests and silpis were honoured during this event and this grand event concluded with Mah satyanarayana puja on 27th May. 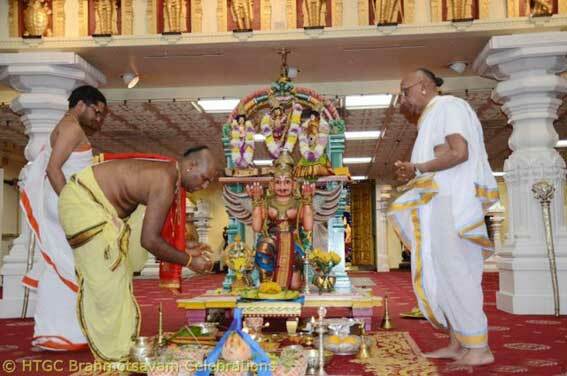 TEMPLE ADDRESS : THE HINDU TEMPLE OF ATLANTA INC.